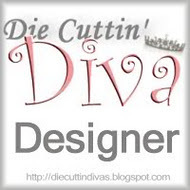 Hi Everyone, and welcome back to another Die Cuttin' Divas Challenge. I used pearls and a punch on my card. The Miss You wording and shadow was cut at 2" from the Sentimentals cartridge. That cart has other great phrases on it, which I love. I also love this paper I used; have had it in my stash for a while (bought singly at Joann's). The punch is Martha Stewart eyelet lace punch around the page that I just purchased and couldn't wait to use. But I had some difficulty making the corners and borders match. Your paper has to be cut to a certain size but it seems if you're off just a bit, it can make a difference. Added pearls to the lace border and corners. Layered the phrase Miss You and popped it up on foam tape. Make sure you check out all the Design Team's fabulous projects this week, and play along with the challenge. Submit your card, layout, or altered project using pearls, pins, and/or punches and enter it at Die Cuttin' Divas by Monday, April 30. Be sure to include a diecut and link back to the DCD blog. A winner will be picked next Tuesday, May 1 when the next challenge is announced! Pretty! Great papers and punch!Love the pearls and Sentimentals cartridge too! Love you're card. Great paper and I love that punch.